Expedition 57 Flight Engineers Nick Hague (NASA) and Alexey Ovchinin of Roscosmos launch atop a Soyuz-FG rocket on Thursday, Oct. 11, 2018. The mission left Pad 1/5 at the Baikonur Cosmodrome in Kazakhstan. During the MS-10 Soyuz spacecraft’s climb to orbit, an anomaly occurred resulting in an abort downrange. The crew was quickly recovered and were reported in good condition. Photo Credit: NASA / Bill Ingalls. 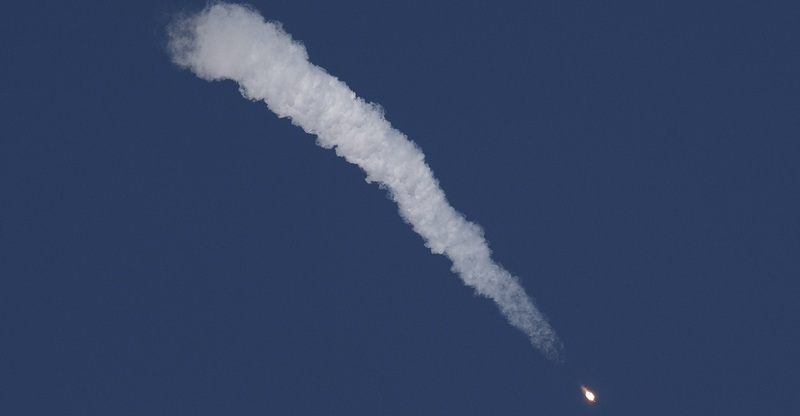 Roscosmos has announced the initial results of its investigation into the Soyuz MS-10 launch failure. According to the agency, the emergency abort was caused by a collision of elements during the separation of Soyuz-FG rocket’s first stage. The Soyuz-FG rocket, with the Soyuz MS-10 spacecraft atop, lifted off from the Baikonur Cosmodrome in Kazakhstan at 2:40 p.m. local time (4:40 a.m. EDT / 8:40 GMT) on October 11. However, about two minutes after liftoff, the launch vehicle experienced an anomaly and in result the launch ascent was aborted. The malfunction forced NASA astronaut Nick Hague and Russian cosmonaut Alexey Ovchinin to conduct a ballistic descent, that ended in a safe landing in the Kazakh steppe. Russia has set up a state commission to investigate the failure of the mission that was supposed to see the pair ferried to the International Space Station (ISS). The first meeting of the commission took place within hours after the mishap resulted in drawing a conclusion that a malfunction during the strap-on booster separation process was responsible for the failure. Now, new information disclosed by Roscosmos, suggests that one of the four strap-on boosters failed to separate properly and that it might have even struck the rocket’s core stage. “There are no final versions but the primary cause is understandable and is related to the collision of a side element making part of the first stage. A collision occurred during the separation of the first and second stages,” said Sergei Krikalyov, Roscosmos Executive Director for Manned Flights via a report that appeared on TASS. Krikalyov added that the collision caused a disintegration of the lower part of the core stage. This accident most likely stopped the rocket’s normal flight sequence. The commission is currently in the process of investigating the disintegrated components of the launch vehicle that were found on the ground. It is hoped that by studying the rocket’s remains will allow engineers to determine the exact cause of Thursday’s failure. According to Krikalyov, final results of the investigation are expected after October 20. The accident has caused all launches of the Soyuz-FG rocket that are currently planned to be put on hold until the exact cause of the failure becomes clear. The Soyuz MS-10 failure could potentially leave the International Space Station (ISS) without crew if the investigation is not completed quickly. At present, the Soyuz-FG is the only rocket that is capable of delivering personnel to the orbiting outpost. “Theoretically, the ISS can be left without a crew. An unmanned mode is stipulated. We will do everything possible to prevent this because the station was created for manned flights. The procedure to deactivate the station is prescribed but it is undesirable and we will try to avoid it,” Krikalyov concluded. One thing I can say is that the emergency escape system worked-It did exactly what it was supposed to do. The other thing is thank heaven that this incident happened to a Russian rocket-RKA has vowed to investigate this as quickly as possible, and get the Soyuz launch schedule back on track within a few months. If this had occurred on the U.S. side, the entire manned space program would be shut down for at least two years, while everyone argued over what the cause was and how to solve it. At least the Russians don’t play around and waste time doing things; they find the problem, fix it right away, and get back to business as soon as possible. Wish NASA had the mentality to be like that. to US built boosters. The Russians have a history of bad performance (maybe due to their rush to flight). It’s a national disgrace that we cancelled the shuttle and had to use a third world country to get Americans to orbit! Astronomical cost as well.